Fizik's Microtek Dual bar tape adds a touch of class to your cockpit with neat stitched detailing and a two-tone effect. You'll need to put some work in to fitting it but once on it's durable and comfy. In the box you get the usual two lengths of tape, short finishing sections for behind the levers, tape and bar-end plugs. The tape is self-adhesive – though not very – and nicely padded, but one thing it isn't is flexible. You really need to be firm when you're fitting it to make sure it goes on nice and snug, beyond the point where you'd be snapping a normal tape and swearing at it. The striped design means you have to be a lot more careful to keep the wrap spacing even too, which is kind of annoying but also good practice. Anyway, once it's on it's grippy and comfortable and it looks very classy. It's pretty tough too, resisting scuffs well. It's a bit more absorbent than a standard tape in the rain but on the other hand grip isn't affected so much by its being wet. All in all it's a good product; it's not a cheap option but definitely one to look at for your good bike. The old Blue Peter standby, double-sided sticky tape, can be useful when bar tape self-adhesive backing isn't all that adhesive. A bit on the very ends, and underneath the levers, will help. But the more you can stretch the bar tape without it snapping the better it will stand up to creep as you grip it during the first few weeks of use. Classy?! Are you kidding me?! That looks bloody awful, I wouldn't put that on my bike if Fizik paid me! I find you can always tell how much a rider cares for their bike by looking at how well their bars are wrapped. I don't care what spec someone's bike is, or how clean they keep it (bikes are meant to be ridden, even in the dirt if necessary!) 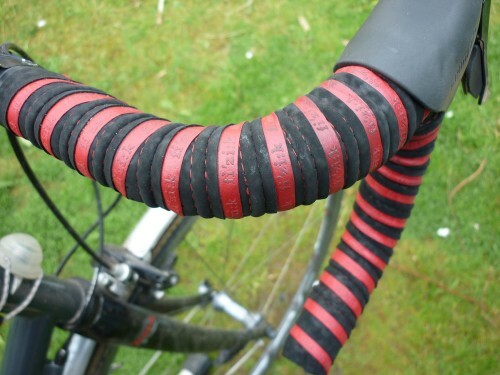 but there's no excusing floppy handlebar tape!! !